JIVE64 donates all proceeds of new-single to help the struggling LGBTQ community. 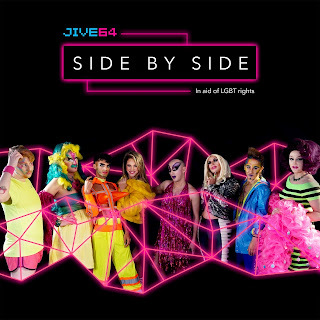 London, England, Jan 24, 2018 -- Taking influence from retro 80's synth pop and modern day electro, JIVE64 present their new single 'Side by Side' which is the centre piece of their campaign to raise money and awareness for those suffering from the lack of human rights for the LGBT community in Chechnya. With vocal inspiration from artists like Bonnie Tyler whilst striving to create unique modern music like La Roux, Jive64 fuse their artistic influences with energy fueled electro. Composing and producing the music is Roy Cohen whilst Ella Tadmor powerfully leads the vocals. Despite the pair working together so well they are in fact based in two cities half the world away, in Dublin and Tel Aviv. The inspiration for JIVE64's new single is the people they are working so hard to help. As the name, Side by Side, suggests, it is about standing together in the face of adversity and against those who deny that people have rights, just because you are a part of the LGBT community. Having already started crowd funding and raising €3,000, JIVE64 intend to donate all money made from their new single to helping those of the LGBT community who are struggling, particularly in Chechnya. The single was produced with the aid of Grammy nominees Pen Up Girls in the hope that the sound would benefit from their experience and it would light up the charts and therefore raise even more awareness for the issue JIVE64 care so deeply about.